The Israeli-US Arrow 3’s successful interception of a mock ballistic missile flying outside the earth’s atmosphere coincided on Tuesday, Jan. 22, with a sniper bullet from Gaza denting an IDF’s officer’s helmet. Tension shot up on Israel’s combustible southern border at the same moment as Dome anti-rocket batteries were being rushed north, the day after an Iranian Fatteh-110 missile was aimed from Syria at the Hermon ski slopes north of the Golan. That morning, in the south, gunfire from the northern Gaza Strip was directed at an IDF engineering truck. Israeli tanks shelled a Hamas position. In the afternoon, a Hamas sniper shot an IDF officer. He was injured but saved from worse by his helmet. The IDF spokesman, whose communiques are often less than accurate, claimed he was struck by a rock. Meanwhile, five Palestinians broke through the Gaza fence to infiltrate Israel, and, once again, the tanks went into action against another Hamas position in central Gaza.This time, the Palestinians suffered casualties, one dead and several injured. This time, too, the prime minister reacted to Hamas’ violation of the ceasefire deal it undertook in return for Qatari funding, by holding back the third $15m installment of Qatari cash due in January. Information was received that the outbreak of Gaza violence was instigated this time by Hamas’ partner-in-error, Iran’s Palestinian pawn, the Islamic Jihad, on orders from Tehran that were relayed through Hizballah in Beirut. Iran had put another of its proxies in play. Instead of directly retaliating for the massive Israeli air and cruise missile strikes against Al Qods targets in Syria early Monday morning Jan. 21, Tehran decided to use its pawn in Gaza to punish Israel. This concatenation of events highlights the complexity of Israel’s military quandary. Iran has managed to pull a tight noose around Israel’s neck from three directions, Syria, Lebanon and Gaza and is building a fourth in Iraq. All of these fronts are bristling with ground-to-ground missiles, a small number of which are precision-guided, although most are not outfitted with exact targeting devices. By now, some of those precise missiles have reached the Gaza Strip, as well as Syria and Lebanon. Israel’s arsenal of air defense weapons is formidable. But they can’t seal Israel’s air space and territory hermetically or nullify the strategic advantage Iran has achieved by the power to inflame three of its borders. On the one hand, Iran’s military capabilities in Syria are diluted by their distance from home base, but, on the other, they are near Israel, on its very doorstep. 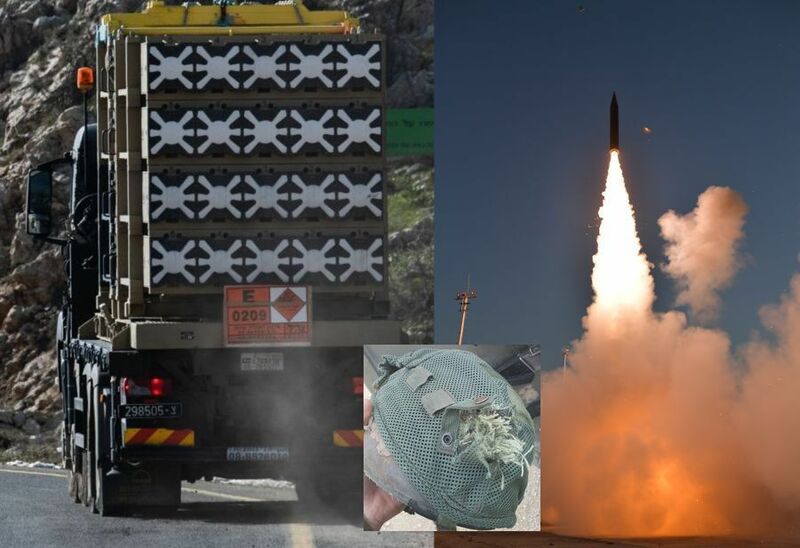 The missile aimed at the Golan on Monday laid bare the presence of mobile surface missiles manned by Iranian officers and teams and deployed south of Al-Kiswah, opposite the IDF’s Golan positions. It was indeed shot down in time by Israel’s Iron Dome air defense system. However, those Al Qods launchers are not positioned outside the atmosphere, but just 25km from the Israeli border. try to gine hamas hisbullah einen Nabka. The enemies of ISRAEL are about to bring there own downfall. Lend-Lease of U.S. weapons systems to the IDF would subjugate Iran’s own geography, e.g., ballistic missile submarines, EMP drones, HAARP, B-2 w/MOAB, HARMs, additional F-35s, antigravity weapons platforms, satellite based projectiles. The Russians promised that the Iranians would be no closer than 80 KM from the Israeli border…………….does this mean that the Russians LIED………………………who would ever have thought that the Russians would ever do something like that! Let’s just call the Russians “Soviets”……………………..OK? Oh. Yes. The Soviets are back in full force with their anti Israel behaviours. I wouldn’t mind seeing the Soviet naval base at Latakia getting demolished by a tsunami and the Soviet airbase at H…. however you spell it destroyed in a tornado. The Soviets are far from home and are meddling as usual. No morals from the Slavic race. Time for Netanyahu to see through all of this nonsense. The Soviets will go too far or let the Arabs go too far and Israel should retaliate and destroy all S-300s in this region and even the S-400s to teach Russia a lesson to go back home to their cold dwellings with their vodka their steroids and their jealousy of the West. Followed by Jeremiah 49:34-39 & Ezekiel 38/39… and the building of the 3rd Temple on the mount. This followed by Israel’s 70th Week per Gabriel in Daniel 9:24-27. The upcoming war might not be the one we are thinking: It might be the Soviets vs. Iran + Turkey. The Islamists will take a break from killing each other to concentrate on the Russian invader. Your content is unreadable with all the salacious ads blanketing the page! One nuke sent to heart of Tehran, will stop them dead in their tracks.